A new visualization of the world of philosophy has been released. Pitched as Google Maps meets PhilPapers, philosophies.space maps philosophy with reference points to subject areas and publications. I spent a little time exploring the site. Zooming into parts of it using the “+” and “-” buttons in the top right of the screen brings you to finer-grained classifications of areas, noted figures, and philosophical works. Clicking on the icons for the latter two opens a window on the person or the work, with link buttons to access the source material. The site is still in beta, and I imagine that the team behind it would be open to suggestions. If you are starting out in philosophy, there’s a bewildering array of different subject areas and it’s very easy to get lost. philosophies.space is our attempt to provide a simple map to all the complexity. Users can start with an overview and zoom in closer and closer, right down to the level of individual concepts and abstracts… The different areas of philosophy can sometimes feel like a complicated jigsaw. As with any jigsaw, sometimes you need to look at the image on the box to see how the pieces fit together. philosophies.space is our attempt to provide such an overview. There’s also a space game-like interface in the works that will allow users to “explore the universe of philosophical ideas as a ‘truthonaut'”. You can view an early demo video of it here. You can check out more about philosophies.space here and access the map directly here. 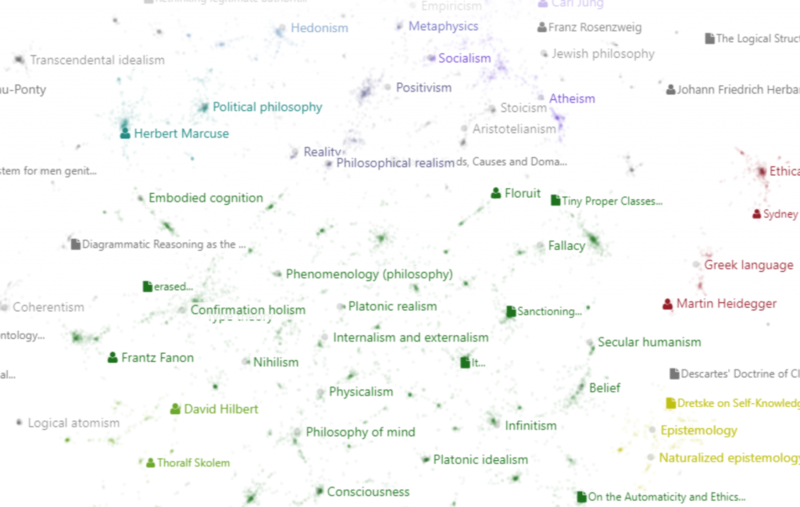 And you can view a number of other posts about visualizing philosophy here.